Faustus, Isaac and Dalmatos O Most High. On the third Dalmatos, Isaac and Faustus died. 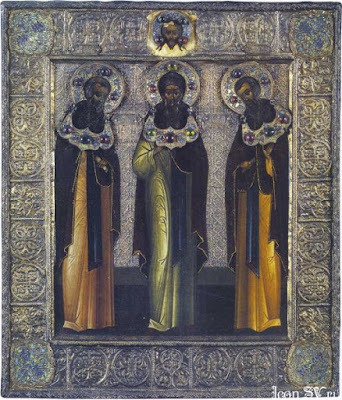 Of these three Saints, Dalmatos was a soldier of the second military academy, during the reign of Theodosius the Great (379-395), and lived a pious and God-pleasing life. Later he left behind his wife, children and worldly things, and taking with him only his son Faustus, he went to Saint Isaac, and became a monk there, attaining great heights of virtue. This wondrous Isaac* dwelt in the quiet of the wilderness from a young age, pursuing every form of virtue, which is why his words were most brilliant, because he was adorned with a virtuous life. When Emperor Valens the Arian went out to fight against the Scyths and Goths, Isaac went to him and said, "Open, O Emperor, the churches of the Orthodox, and you will be victorious in battle." The emperor was not persuaded, but in a rage said to the Saint, "When I return from battle, I will punish you for these words." In reply the Saint said, "Whether you return from battle, the Lord God has not mentioned to me. Therefore you will wage battle, but when you seek to flee from your enemies, you will be burned alive." This indeed took place, for he shut himself up in a barn, and there he was burned alive. 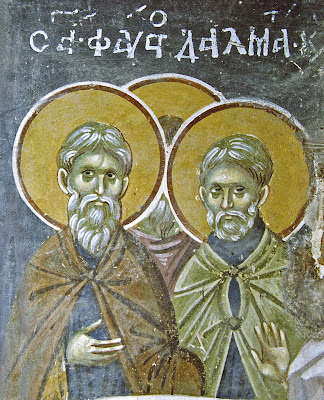 When this Saint came to know that he was to depart to the Lord, he established Dalmatos as abbot of the monastery,** when Saint Atticus was Patriarch of Constantinople. Saint Dalmatos became eminent in asceticism, and after remaining forty days in a state of fasting, for the same amount of time he was in a state of ecstasy. Thus he was venerated and revered not only by the emperor and the legislative body, but also by the Holy Fathers who gathered in Ephesus for the Third Ecumenical Synod of 431. They elected him to become an Archimandrite, and those after him were granted to be authorities forever of their monastery. When the renowned one became adorned in this way, he departed to the Lord, and was buried at his monastery. * St. Isaac is celebrated separately on May 30. ** It is believed that the monastery founded by Isaac took its name from this Dalmatos. However, according to another tradition, his monastery was originally built by Dalmatos the Patrician, a nephew of Emperor Constantine the Great, and it received its name from him. Yet others maintain that it received its name from both of these, and that is why its name in Greek is in the plural, Dalmatoi instead of Dalmatos. 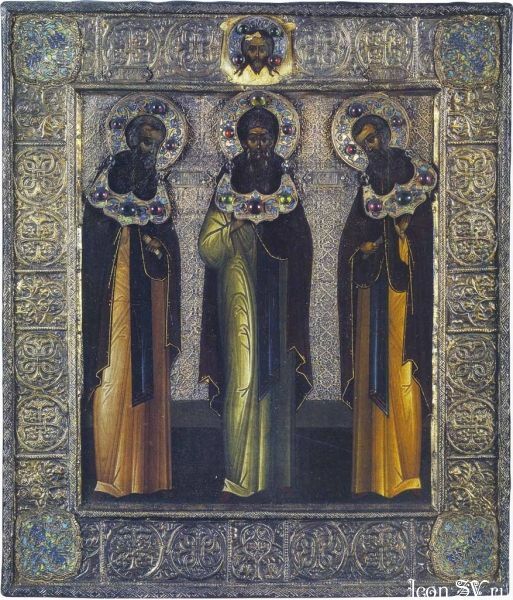 Let us honour the triple choir of venerable fathers, glorious Isaac, Dalmatos and Faustus. They dispel the night of passions by the three-branched lamp of Christ the Light and by their virtues illuminate those who cry: Glory to Him Who has made you wonderful; glory to Him Who has magnified you; glory to Him Who through you works healings for all. By asceticism you shone like lights in the world, and by your faith you overthrew heresies. 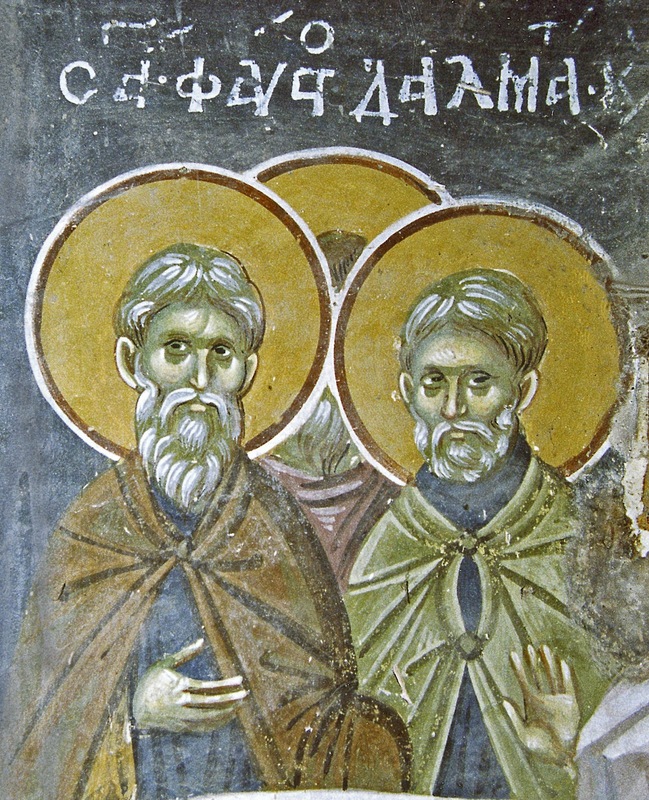 O Isaac, Dalmatos and Faustus, we praise you with hymns, as servants of Christ who are praying for us all.